A home burglary is terrifying. It can leave you frustrated, angry, scared, and sad. 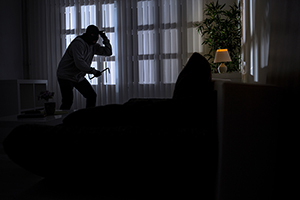 It’s a good habit to periodically examine your home, routines, and security to prevent these break-ins from happening. Can anything expensive be seen through the windows? Could a burglar hide in your bushes? Is your house well-lit at night? Do people in the home have routines that make it easy to figure out when the best time is to break in? Gravel is loud when you step on it. Place it near windows.